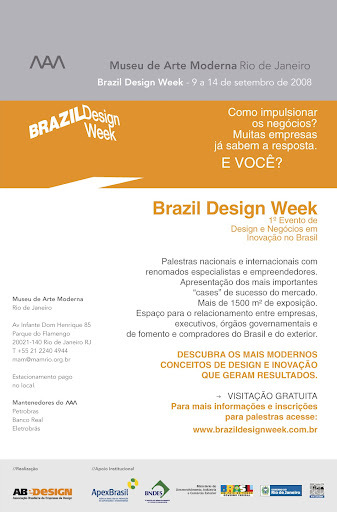 the registration for the lectures and workshops and more information about the event is available at the website of the brazil design week. i will be taking part of it coordinating the governmental policies forum, which will bring from korea the representative from kidp, tae-wan kim, from spain, eliza sáinz ruiz, ceo from ddi, and, from the united kingdom, michael thomson, president from beda. soon i will be posting also something about rio+design, an event promoted by the state secretary of development, which will be held at the same time and will involve design schools, commerce and several institutions in the city of rio de janeiro.